Few corporate brand names in education are as recognizable, and as polarizing, as Pearson, the giant education provider whose reach extends to virtual schools, testing, language training and an array of other areas. Many educators these days see Pearson as the embodiment of commercial businesses’ continued push to turn profits from public schools. Pearson has been criticized for everything from its deployment of curriculum in districts’ 1-to-1 technology programs to the prominent role it plays in high-stakes testing. Yet by its financial measures—including its $7 billion in annual revenues—Pearson is clearly providing products and services that are in demand in many schools, districts, and states, and among individual parents. 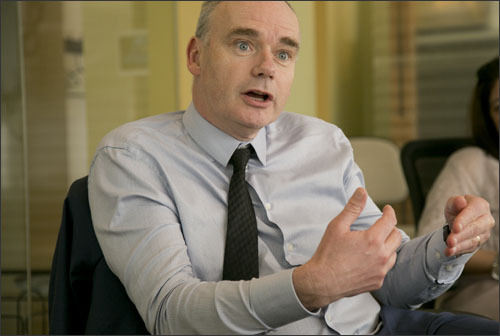 Pearson CEO John Fallon recently met with a group of reporters at Education Week’s offices and spoke about his company’s business strategies and record, and offered a defense against some of its detractors’ claims. He also talked about how he thinks policy shifts like the implementation of the common-core standards and the adoption of “open” educational resources are likely to affect the K-12 market, and his company’s work. Here are takeaways from Fallon’s remarks in response to questions from a group of reporters, edited for brevity and clarity. Pearson officials have been talking about shifting away from being identified as simply a publishing company for years now. Fallon described the scope of the company’s reach in different areas of K-12, higher education, and professional training. Pearson’s annual revenues stand at about $7 billion, of which 50 percent come from courseware/content, in K-12, higher education, and across the professional space, Fallon said. Those resources are increasingly delivered in digital form. Thirty percent of the company’s revenues come from assessments of one kind or another, which includes professional certification and apprenticeship programs, as well as summative exams. High-stakes testing, specifically, produces “less than 10 percent of our revenues, but feels sometimes like it generates 150 percent of the news flow,” quipped Fallon. Pearson is a major player in virtual schooling, through its operation of Connections Academy and other programs. Recent studies, including one by Stanford’s CREDO project, have shown virtual schools producing poor results. 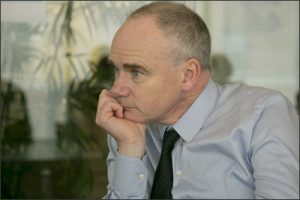 Fallon was asked why parents and others should have confidence in Pearson’s online schools, despite the negative findings for virtual education. “It’s important to speak in specific rather than general terms…It’s not always the case, but it’s fair to say there’s a disproportionate number of students in virtual schooling who are there because physical schools have failed them in some form or another. So it’s going to be important that we track value-added, or progress-added. “We see technology as the means by which I can apply the benefits of teaching to far more people, and you can help free teachers up to spend more time with students, engaging students, learning from each other. Technology is not a panacea, it’s just a tool, and its primary value is in enhancing the power of teaching to reach more people. Many critics accuse publishers, including Pearson, of making exaggerated claims of having aligned academic materials to the Common Core State Standards, while having only made superficial changes. Fallon was asked by EdWeek reporters about a review of a Pearson curriculum by the organization EdReports that gave one of the company’s curricula a poor rating for common-core alignment. Fallon official pointed a response by the company that argued that the EdReports analysis was flawed, and he said Pearson’s overall record in aligning its materials to the common core is “very good,” overall. But he said the implementation of the common-core is a massive task, and that support for educators and schools in making a transition to the standards has been lacking—one of the factors that has fueled mistrust in the K-12 community. “You have to work with the gray—that is the day-to-day reality of the classroom. We [made] probably the biggest single investment [in the Pearson System of Courses, which] completely rethinks the way that numeracy and literacy are taught in the classroom. It would be the absolute poster child for the common core, and the new way of teaching…in the long run, it will prove incredibly liberating for the profession. But it is not a simple, straightforward thing to implement a program like that. It will take years, it will require very significant amounts of professional development. It will require you to rethink how the working day in the school operates. Those things take time. “In hindsight, one of the mistakes that were made around the implementation of the common core was to think you could switch from No Child Left Behind, that you could click your fingers and it would happen in one fell swoop. It will take the better part of a generation for the benefits to flow through, because it’s such a fundamental step change. Frankly, where a lot of support from the teaching profession for the common core tipped over into antagonism, and concern, was because of the way the assessments were introduced. For example, there wasn’t an understanding in terms of tracking and measuring teacher performance against those standards; you needed to give a significant amount of time for it to bed down. Now, the reality is that it happened in the end, but it was done slightly late in the day, and almost grudgingly. It would have been so much better if everyone had been more open and honest about that much earlier in the process. “The move toward a world of fewer, better, smarter assessments that provide more actionable data more quickly to teachers and parents is important. We would say that an assessment should be only one measure of progress. It should be part of a richer dashboard, a more holistic view. McGraw-Hill Education got out of high-stakes testing entirely last year. Given the continued controversy around summative exams, and periodic problems associated with giving them, could you see a day where Pearson says goodbye to high-stakes testing entirely? “Just to put it in context, Pearson successfully conducted 15 million on-screen tests last year. We did, as you know, have a problem in New Jersey, and we’re sorry about that. But the tests resumed the next day, and have been very effective since then. Our onscreen testing is very reliable, secure, it works, and we can provide much richer data, and we can provide useful information back to teachers and parents. And it’s what enables formative and summative assessment to converge. It’s much harder to see that if we go back to the world of paper and pencil, bubble tests….they’re not fit for what we need to prepare young people….to apply things to the real world. Pearson was one of the companies, along with Apple, that was faulted as the Los Angeles Unified school district’s 1-to-1 iPad program, faced technical breakdowns and backlash. Pearson’s common-core aligned curriculum was supposed to come pre-loaded on iPads, and the company was criticized by those who said it wasn’t ready. The company recently agreed to pay more than $6 million to the district. “Moving to 1-to-1 learning, to where the role of the teacher becomes much more one of coach and [providing] support to children, where you’re trying to introduce more peer-to-peer learning…and do so in a technology delivered-world, that is a very different world than the reality that exists in many schools today. And it takes time. And the lessons to be learned, not just from there but around the country, are that there is still a lot of work to be done, to get really good, high-quality…e-commerce-grade tech infrastructure and experience in schools for students. That’s not to say there has been a lot progress—there has…But I think that is a prerequisite over time to giving teachers competent ways to deploy technology effectively in schools. And about the specific accusation that Pearson’s curriculum was not ready in time for LAUSD? Many districts have embraced open educational resources—free materials created on licenses that allow their distribution, re-use, and repurposing. Fallon argued—as many providers of commercial materials have—that OER can provide benefits to some schools, but that commercial resources will continue to have value because of the tech-based enhancements, in analytics and adaptive learning and other areas, that they offer beyond academic content. Open resources are “an important part of the landscape…Quite often, they’re used as supplements to a core teaching program. If you think about what the next generation of technology will look like, it’s a really immersive learning experience, that will provide learning analytics that enable teachers to have more actionable diagnostics that give them more personalized information around each student and creates much more personalized learning for students. “That’s not something that can be done without continuous and sustained investment, and that investment has to funded from somewhere. Ultimately, it has to be paid for somewhere in the system. That’s why I think there will be a diversity and range of [materials]…I think there will continue to be a market for a long time to come for high-quality courseware, pedagogically sound, fantastic content, developed in a way for teachers that is an inspiration for them to teach and for students to learn, and [which is] providing much more adaptive learning and learning analytics. But it will be paid for if it demonstrates real value [in]…helping more students to be successful and make progress. If it doesn’t, it won’t, and it won’t deserve to. Photos of Fallon by Charlie Borst, Education Week’s director of photography. He said his company’s test provide useful information back to teachers and parents. Yeah? So the test our students took last spring gave us useful information in OCTOBER of the following school year. THAT’S the turnaround. Parents and teachers can see how Little Jimmy did on that one day last year. Of course, they cannot see the QUESTION. They CANNOT see the ANSWER. They can TRUST that the question and answers were valid and fair. Right. It isn’t like test questions and answers have been found, publicized, and found unfair or invalid, right? They get some numerical score showing how Jimmy did on a test that is NOT on what he learned! Are the districts provided books and practice tests? So the questions are based on what common core SAYS, not on what is in the ACTUAL TEXTBOOK? This is useful, how? So, if your district isn’t rich enough to buy PEARSON books and prep materials your children get lower scores and that is useful- again, how? As an example, a test suddenly uses a whole new paradigm in answer form. Suddenly, students have to pick SEVERAL correct or incorrect answers and list them all. Students who have NEVER faced THIS test maker’s question paradigm are at a huge disadvantage to students who HAVE been exposed to the way Pearson asks questions and the expected answer form. Just stop this nonsense. There is no other rational way to describe high stakes testing (on material NOT in Jimmy’s textbook if he isn’t from a rich district), it is nonsensical. Your state entered into a contract with someone to provide them with tests and scores. Maybe you could check the contract that your state entered into, on your behalf, with your tax dollars, to see what schedule was required. As one of the people staled to make millions off the new common core CRAP he is not a trust worthy spokesman. PEARSON is literally a case of “The Emperor’s New Clothes.” Everyone wants to appear knowledgeable so no one lets the world know that they’re not worth a damn. It’s all about making money. We’ll make tests. You cannot know the questions. You will not know the answers. You’ll fail tests. We’ll berate you. We’ll sell you programs/ texts to pass the tests. We’ll change tests. You’ll fail tests. We’ll sell you programs/ texts to pass the tests. We’ll change tests. You’ll fail tests. Here are examples of Smarter Balanced errors taken from the online Third Grade Practice Test. Pearson laid the common groundwork for both PARCC and SBAC. Questions 2, 11, 13, 27: This particular Part A/Part B format is confusing even for adults, let alone third graders. Should it assess test taking ability or actual knowledge? Question 10: Correct punctuation requires quotation marks around “placed one on top of another”. Question 16 has a typographical error: “Move the groups of sentences so that the group that makes the bestbeginning (sic) comes first.” Oh, my. Meanwhile, even English majors don’t agree on the best sequence for the story. Question 12: “What inference can be made about why the author includes the backpack in the passage?” Most eight-year-olds do not know how to “infer”, because they don’t yet understand abstract concepts. It shows that no early childhood expert helped write this test. Question 21 is too wordy for third graders: “Which of the following sentences has an error in grammar usage?” Why not, “Which sentence uses incorrect grammar?” Question 23: You can’t even get adults to agree why the author read aloud to little kids about The International Space Station. Such shoddy quality and lack of age appropriateness are why few colleges accept Smarter Balanced scores. First of all, Pearson had nothing to do with SBAC. I know, because I worked on SBAC. Second, the fact that you can find a few things that you consider errors in sample questions does not mean that the actual test is invalid. “It will take the better part of a generation for the benefits to flow through.” When there is no change, or change for the worse in a generation, Pearson will already have raked in billions of dollars. Pearson will blame teachers or someone else for its failures, and quickly offer some new snake oil. This is standard operating procedure for the educational/industrial complex. As a leader and teacher in an independent school for 17 years, my recent experience with Pearson is that it comes across as quite a racket, deterring many a private school teacher from engaging in the public school credentialing maze. After years of saying “never!” -I decided to finally bite the bullet and get a public school credential by taking Pearson’s tests. My next test – and this is in 2017 – is to show understanding of ed technology based on 2001 technology! Incidentally, there is no linear way to study unless you take a course on this – a funny notion. It is not attractive that seasoned, mentor teachers who are educational leaders in private schools must demonstrate introductory level chops rather than be able to apply directly to public schools based on experience. This is what I mean by the appearance of Pearson as an educational racket. Private schools are excellent, but even deeply discounted, they still price out many of their own teachers from sending their own children there. Our students do not undergo standardized testing in private schools, but our own kids are submitted to these tests in public schools starting in elementary school. They become like guinea pigs for research institutions because teachers are administering irrelevant tests – eschewed by private schools – and they are unavailable to teach children whose families are told they could opt them out of two weeks of testing. Sure, and to do what instead and where, and with whom? There is no choice to not test unless they sit in a principal’s office or with some aide. I am blown away by the socioeconomic advantage-taking that industry and politics indulges in with public school children while private schools would never tolerate such interference and outside control. We are flush with family donations and can call ourselves independent non-profits. Public schools do have great teachers, but the gatekeepers -Pearson apparently at the top, with state governments’ support- have political and monetary interests that eclipse kids’ needs and teachers’ effectiveness. It is too bad that public schools cannot hire freely as private schools can, and cannot eschew standardized tests as private schools can and do. This is not a level playing field. Business and politics deserve to be under the thumb of public and private school leaders and teaching experts who are actively interfaced with neuroscience. This is where real results happen. Pearson and state governments would be wise to work for us instead of having us work for them, effectively lowering our standards. Maybe I’ll get to be a public school teacher some day, if I pass all of these standardized tests. I’m curious to see where Pearson’s revenue comes from, but suspect it’s predominantly from public schools. We need public schools to be allowed more choice, just like their independent counterparts.